Mercer Wisconsin- LOON CAPITAL of the World! How much does a 16 foot loon weigh? The Mercer Loon, which made its debut on May 22, 1981, weighs approximately 2000 pounds. 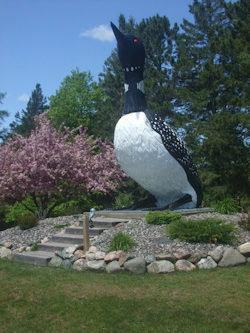 It was erected at the location of the new Mercer Chamber of Commerce building to emphasize Mercer’s claim as the “Loon Capital”.